""It's about time, eh?" President @barackobama welcomed Prime Minister @justinpjtrudeau of #Canada to the White House earlier today. This is the first state visit by a Canadian leader in 19 years, a diplomatic honor made possible in part by new pledges of cooperation on combating #climatechange. 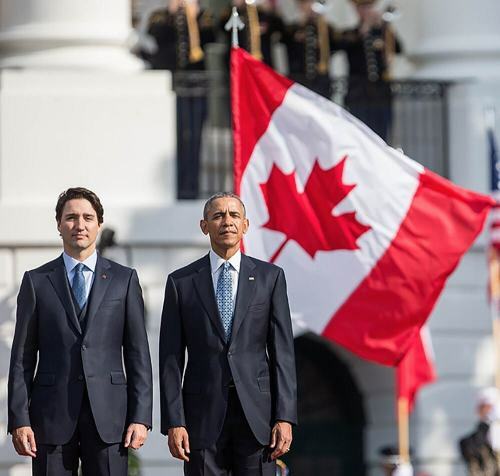 The 2 leaders promised that Canada and the U.S. would "play a leadership role internationally in the low carbon global economy over the coming decades." The climate announcements came before a day of ceremony that will finish off with a state dinner. @zachgibson5 photographed the leaders during an arrival ceremony at the White House." By nytimes on Instagram.